Juri Ratas is a loyal, enthusiastic Center Party politician with a sharp sense of humor. At the age of 27, he is the youngest mayor in Tallinn’s history. Initially, many were skeptical that this young Centrist could handle the responsibilities of city mayor, but Ratas has proved himself over the months. He has won the respect of many politicians for his ability to compromise and his dogged determination to turn things around in Estonia’s capital. When you took the post of city mayor in November 2005 your aims were probably already set. What goals have you achieved that you’re proud of? Can one achieve something in four months? (shows pictures of previous mayors, one of whom held the post for 10 years). We spent a lot of time on a new budget. Usually, the opposition does not approve the budget the first time round, but this time they did. Every city mayor has to be a visionary, and one of our aims this year was to receive the title of European Capital of Culture 2011, which we did. The city has also proposed the idea of creating a ‘Green Capital of Europe.’ One of our main goals when joining the EU was to speak out for better cooperation. This – and the Estonian city in Europe – is one of the initiatives we want to start. One of Tallinn’s main goals is to get hazardous cargo out of the city in order to protect our living environment here. We also plan to improve the highway that takes visitors from the airport to the city and open our seaside to citizens. Tallinn’s seaside area spans 46.2 kilometers, 30 of which can be opened for a walkway. The remaining 16.2 kilometers could open in the future. We’re definitely going to solve the question of forced tenants. (Thousands of Tallinn residents have received the status of forced tenants when the houses they inhabited were returned to pre-war owners – ed). We plan to build new municipal flats for these people. A program adopted in 2002 has proposed establishing 5,000 new flats. When we look at municipal funds in other cities, such as Helsinki and Stockholm, the amount is much bigger. Generally speaking, Tallinn should be a good place to live for citizens and a good place for our guests. Many tourists agree that Tallinn is a nice city, but they are astonished by the poor conditions of its roads. Why hasn’t the city been able to repair them? Are you waiting for European support? Tallinn has gained very little EU financial support for repairing city roads. This year we received some support for the analysis of our mainland connections. We also received funds for the construction of a waste dump. We are currently applying for funds that will go toward the reconstruction of various road crossings. Going back to opportunities for the so-called forced tenants, many citizens are disappointed by the price of the flat given to them. Some cost only 1,000 euros, for example. Compared with the privatization opportunities back in the early ‘90s, the ratio of real estate prices to salaries is not so favorable, some argue. Why shouldn’t these people be disappointed that they weren’t given the opportunity to privatize their flats like most of us did? We analyzed this situation and found that today’s calculations are based on those of the ‘90s. These are not set by the local government but are decided on the governmental level. This inequality has to come to an end. There are over 2,000 forced tenants in Tallinn, and we seriously want to find a solution to this problem by 2008 at the latest. In comparison, there are over 11,000 such people in Riga. A home is something you cannot play games with. After we have solved this issue, we will start a new municipal construction plan to support young families. We are not planning to privatize flats, but rent them out on more favorable conditions. Edgar Savisaar, head of the Center Party, has a lot of fans and a lot of enemies at the same time. How would you describe him? What makes him so popular? He is certainly a person there is a lot to learn from. I think he is popular for what he has done. When Savisaar received the most votes in Tallinn’s local elections, he could not decide for a long time whether he would continue as minister of economy or take the post of Tallinn mayor. Is it possible that he has continued managing the city through you, as a loyal and young politician? (Goes to the cupboard and opens the doors) Do you think Savisaar is here? First of all, the idea that Savisaar sits in some city government cupboard, where I go to get advice from him, is not true. Secondly, when the Center Party had 32 seats on the City Council, then our party leader was the minister of economy. He has done his job well. If we compare the local municipality budget of road construction, it has increased by more than two times compared with previous years. Of course the decisions of a minister have helped the heads of local municipalities. Take changes in the legislation of forced tenants for example. None of the other parties wanted to join the coalition after the last elections in October. How does the situation differ today? The Center Party is in a coalition with civic residents. We have to run the city so that it becomes better for citizens. I am not a Center Party mayor, but a city mayor, and I have to see things from a wider perspective. As deputy mayor, I gained experience from being in a coalition with the Reform Party and Res Publica. There are many pros and cons. The main thing is to maintain stability. A vote of no-confidence was launched against you at the end of March. One of the reasons was your decision to buy property on Harju Street for a price that, according to the opposition, was two times more expensive than the market value of 75 million kroons (5 million euros). Can you briefly explain this decision? This can not be explained briefly. This property has 62 years of history, and for the last 19 years we only see the ruins. When we walk there with our kids, they ask when the war ended. They ask if it was last year. The bombing of this property was 62 years ago. A city that belongs to the UNESCO World Heritage site can not have ruins. These have to be covered up. Generally speaking, we have not initiated a city government that reads news from the computer and feels comfortable. We have to find solutions to problems. We have to think about alternatives here, why such a solution was decided. One alternative is to keep these ruins; another one is to build something on top, but our society cannot come to an agreement on this. We can have greenery that is pleasant for everyone. Talking about the cost of the deal, the negotiations lasted for two years and started with a 330 million kroon offer. The city won 180 million kroons from its initial offer. The opposition claims that the price should have been 75 million kroons. Private property is holy and immune. The city cannot dictate its price. Besides, the price of 75 million kroons is based on the cost of property a couple kilometers outside Old Town. These areas are not comparable. Talking about real estate, former Mayor Tonis Palts banned the construction of so-called ugly buildings. The Viru Hotel owners, in their plans for an expansion near the Old Town, were hoping that the new City Council would accept their proposal. We have not given them permission. The city has asked an opinion from UNESCO, according to which Tallinn has to preserve its Old Town and its surroundings. We have to proceed from here, and we should protect our Old Town, as a cultural capital. So Tallinn has been nominated as European Capital of Culture 2011. What does it mean? The idea originated from Greece in 1983 when its minister of culture called together its colleagues from Europe. They decided that Europe needed to place a higher value on culture. Two years later, Athens was the first Culture Capital. In a few years, it will be Tallinn’s turn. Tallinn competed for this honor against four other Estonian cities. In the end, the Republic of Estonia chose Tallinn as its candidate. There will be another city from Finland, which hasn’t been chosen yet, that will also bear the name of European Culture Capital 2011. The main aim is the same. We should pay more attention to our environment. We can never pay too much attention to the environment. Tallinn should be a city that has done something great in terms of ecology. Just like those ministers who gathered in 1983, we plan to call all city mayors to Tallinn on May 15, during the Old Town festivities, and sign a joint plea to the European Commission to proceed with this idea. I have met several city mayors, and already have their support. When it comes to foreign policy, Toomas Hendrik Ilves is one of the most well-known experts in Eastern Europe. Seven years as Estonia’s foreign minister, together with the perspective of a former U.S. citizen, give him special insight into foreign affairs. As he says on his Web site, his most important challenge as member of the European Parliament, where he serves as first deputy chair of the foreign affairs committee, is to be as effective as 10 representatives. Born into an Estonian family in Sweden and educated at Columbia and the University of Pennsylvania, Ilves’ horizons stretch well beyond Estonia. The Baltic Times met with Ilves to discuss his experience in the European Parliament, relations with Russia, and his rather unique theory about Baltic identity. What are your main responsibilities as first vice-president of the European Parliament’s committee on foreign affairs? My primary responsibility is running the committee when Elmar Brok isn’t there. As a bureau member of the committee (i.e. – president), and three vice presidents of the enlarged bureau, which includes representatives of the political groups [factions] in the Parliament, we decide who does which reports. In general, I am most concerned about the Europe east of the EU: Ukraine, Georgia the Balkans. I am the Parliament’s standing reporter on Albania. When you were appointed in July 2004, you said you’d deal with EU relations with Russia. At the time, you said that, in the opinion of many new member states, EU policy has been too trustful of Russia. This has turned into a significant dividing line in the Parliament, with new members taking a far more skeptical, and I would argue, realistic view of Russian behavior than older members. I wouldn’t say “too trustful” of Russia – simply naive. Then again, old members don’t have Russia as a neighbor. Nor have they experienced Russian/Soviet occupation. All in all, this does produce a disharmony of perspectives between old and new members. A number of old member states have also behaved in ways inconsistent with EU practice. Gerhardt Schroeder’s pipeline deal with the Russians, done without consultation with four countries directly affected, is not something for the EU to be proud of. It does show, however, how little the EU counts when national – perhaps in this case personal – interests come into play. When you ask an EU representative what the first thing that comes to mind regarding Estonia is, they say it’s a country that doesn’t request much – neither support for farmers nor transition periods in other areas. You also have said that Estonia doesn’t take advantage of its membership in the European Union. Why is this so? I don’t know why. I suppose it comes partially from a natural reticence on the part of new members, especially with our cultural habits. It is not so much a matter of asking for something but participating actively in forming EU policy. Indeed, I think that, as you phrased it, the question has the same entitlement mentality that dominates new members’ thinking and keeps them from accomplishing much more in the EU. As long as it is a matter of “Gimme, Gimme, Gimme” and “How much did everyone get?” we will have little impact on EU policy. Estonians, like many new member states, tend to think that if an issue doesn’t directly affect them, there’s no point in pursuing it. This stands in stark contrast to older, more experienced member states, most notably Finland, which realized long ago that if it wishes to be a player in the EU, it needs to take an interest in and support the efforts of others, even if the issues are not immediately of Finnish concern. Secondly, too much of Estonia’s EU policy is handled by what used to be the “international relations departments” of various ministries. There is little coordination consultation between ministries regarding Estonia’s national interests, above and beyond the more narrow interests of a particular ministry. Without coordination of the sort – let’s back off on this issue in the Social Affairs Ministry and get the support of France on issue X in home and justice affairs (this is a fictional example) – we won’t really get what we want. Then again, I suspect that many people in the government simply don’t know what Estonia wants. In general, I believe the prime minister’s office should get much more involved in EU policy than it currently is. Do Baltic representatives cooperate much in Brussels? It depends on the issue. In the EU, one cooperates if there are shared interests. It may turn out, however, that there is a convergence of interests between Estonia and the U.K., or Estonia and Cyprus. It is quite pointless to talk of a priori cooperation with anyone. As Lord Palmerston said, “States don’t have permanent friends, they have permanent interests.” This is also true in Europe. Different countries have different interests, and most realize that cooperating will get you further. But there is no such thing as a natural “Baltic interest,” except for perhaps the Baltic Sea, and here one must also work with the Swedes, Finns, Danes, Poles and Germans. On TENS (Trans-European Networks) it is clear that Balts, Poles and Finns need to cooperate, etc. Do you sometimes feel that ties are not strong enough between Estonians, Latvians and Lithuanians? I would say that ties between Estonians, Latvians and Lithuanians are far stronger than with anyone else. I am probably the biggest defender of Latvia in the European Parliament. But I really am tired of these kinds of questions. We aren’t teenagers. We don’t constantly have to examine our relationships and feelings about each other. Indeed, I find these discussions take the place of having nothing else to say. Relations must be based on mutual interests – of which there clearly are many – and not on romanticism. Estonian politicians usually call Estonia a Baltic country. You, however, prefer to call it a Nordic country. Why? I have written at length on this, and I really don’t see the need to repeat an argument I made seven years ago. But the main point is that Nordic countries provide Estonia with a cultural/social model that I would like to see adopted. I see no model called “Baltic.” This in no way precludes political, military and other forms of cooperation, but frankly I am tired of answering this question until someone comes and defines to me what “Baltic identity” is. Since no one has done this, I refer people to my article from many years ago. What is the future of Estonian-Russian relations? As long as Russia fails to come to terms with Estonian independence, or, on a greater scale, the “greatest tragedy of the 20th century,” Mr. Putin’s characterization of the collapse of the U.S.S.R., I doubt we will see much of a change. This has little to do with Estonia. We see Russia treat Poland, Ukraine, Georgia in exactly the same neurotic way that has more to do with its own inability to deal with its past than anything Estonia has or has not done. I understand that, in your opinion, the best way to treat Russia is to ignore it. But improving relations with an eastern neighbor could open several business opportunities in Russia, couldn’t it? I simply believe that meeting the current demands of Russia and the concomitant costs to Estonian statehood and democracy is too high. Sure there are oil-transit trade businessmen who think they can make even more money if only the Estonian government would make Russian a state language or some other silliness. I personally don’t think Estonia should represent the financial benefit of a few people who plan to spend the rest of their life in Marbella, Spain anyway. If you want to make money from Russia, move to Russia. Moreover, with EU membership, double tariffs have been removed so there should be no formal problems making money. If there are problems, they’re of the sort that don’t belong in civilized business dealings. On the other hand, any country that places political requirements on doing business is of dubious reliability as a partner anyway. How would you solve the current situation with Estonian Railway? Should the government purchase the shares in order to avoid Russian capital taking over Estonian transit business? I have no opinion on this, as I do not know what the current situation is. In general, however, and as the current port-sale debate in the U.S. and the Mitall case in Europe shows, countries are sensitive about their infrastructure being bought up by foreign citizens. On the other hand, there is little one can do about it in a globalized world. After catapulting to the political summit in 2003, the Res Publica party has seen its fortunes tumble after a series of mistakes and debacles, most notably the Lihula monument episode. Now in the opposition, the party is trying to win back its erstwhile reputation of a pro-business force prepared to wage war against bureaucrats and government corruption. 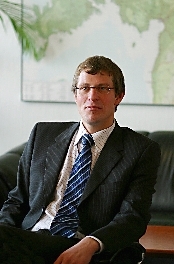 The party is currently lead by Taavi Veskimagi, vice president of the Riigikogu (Estonian parliament), who, after two years as finance minister, instilled his libertarian ideology on the party. Veskimagi argues that Estonia should maintain low taxes and as few exemptions as possible. In order to curtail inflation, which is threatening to derail the country’s hopes to phase in the euro in 2007, he is proposing a temporary VAT exception on food products. He met with The Baltic Times to discuss the party and his vision of Estonia in the future. How does Res Publica differentiate itself from other parties? What is your message? Res Publica is a center-right party. The main virtue we stand for is that we want people to have independence and opportunities to arrange their own lives. We are against bureaucracy and over-regulation. We want people to be able to ensure education for their children, engage in business and save for old age. Transparent and honest politics is one of our [most important] values. We are a party that is essentially future oriented. If the economy is doing well today, then we should build a basis for future growth. We believe that people in need should be supported, but it should not be massive support. We believe that those who work more should make more. What was the secret to Res Publica’s success in the 2002 local and 2003 parliamentary elections? Your party received 15 percent of the votes and 25 percent of the seats in Riigikogu, but in last year’s local elections, Res Publica received only 8.5 percent of the vote. The key to success was that we promised to act honestly. Our slogan was “choose order.” Looking back to that time, there was a scandal surrounding the privatization of Estonian Railway and an attempt to privatize Narva Power Plants. There was a mess, and people were certainly tired of the not-so-transparent way of politics. In this respect, I can say that while in power we did good things, and we certainly made mistakes, but one thing I can confirm is that we never confused the state wallet with our own. Regarding the local government elections of 2005, we achieved normal results. We received more votes than the Social Democrats and as many as the Pro Patria Union. Although we both received 8.5 percent of the votes, the results of Pro Patria Union are taken as a big achievement and ours as a loss. This shows what potential the party has. I am glad that we are in power in about 50 local authorities around the country, while in 2002 when the election results were much better, it was 15 municipalities less. According to professor Rein Taagepera, one of Res Publica’s founders, the party has moved to the extreme right and cares only for those who can succeed by themselves. When Res Publica came into politics, we said we would conduct our politics differently. We did not define ourselves on a political scale. Today I lead the party and have the support of its members. Of course, from the perspective of Rein Taagepera’s centrist-left views, I am his opposite, and he is entitled to have his opinion. But one person’s views do not define the ideology of the party, and his resignation demonstrates this. It is sad that he left the party right before the local elections, that gesture received more attention than it should have. As vice president of the Riigikogu, you strongly supported the pay-raise for teachers by prolonging the budget debate. We are a party that looks into the future, and one thing is very clear – we have to invest in education. We started several programs when we were in power. One of these was to send 100 students every year to study abroad at government expense. We also raised teachers’ wages by 12 percent each year we were in power. Each child should get an education that is appropriate to his or her capability and talent. This way they can manage their lives in the future, as the state should not take care of them. We have to maximize Estonian surplus value, and a good education is a prerequisite. They leave? I don’t see it as a problem that several young people leave the country. It is good if they leave temporarily for studies and return. There is a lot a government can do here for them to come back. I have seen few people who leave the country because they do not want to live in Estonia. They leave to find new experiences, better incomes and self-determination. The state should provide opportunities for them here. That is why today’s politics bother me. It’s based on short-term aims. The People’s Union and the Center Party play on elderly people to succeed in elections and actually forget about tomorrow. You were rewarded by the Estonian Tax and Customs Board as a “friend of the taxpayer.” Why? What are your views in terms of taxes? It is because I actively supported the tax policies that have brought us success: the liberal economic policy, conservative currency policy and balanced budget policy. I did not give in to the pressures of huge [EU] member states to harmonize corporate income tax and domestic socialist plans to establish tax exemptions and add duties to taxpayers. We should keep low tax rates, a wide tax base and as few exemptions as possible. It has to be clear and transparent. You proposed a 5 percent corporate income tax starting from 2009 when Estonia can no longer use its system of zero taxation on reinvested profits. Estonia has a unique taxation system in Europe, where profit is not taxed when it is formed, but when it is taken out. Estonia has to create a new tax system starting Jan. 1, 2009. We want to create an even more attractive corporate income tax system, taxing, for example, profits at a 5 percent rate as they are formed. Here we should not forget that taxes should also have to be applied to dividends payable to individuals. It could be about 15 percent. Could this leave an impression of Estonia as a tax paradise? A problem could arise with a 0 or 1 percent rate – 5 percent should be okay, provided that we also tax dividends. A former German minister of finance came out with the same message that Estonia was almost a tax paradise. Estonia’s corporate income tax rate to GDP is higher than in Germany. This shows that, while our nominal rate is low, the actual effective rate is the same or higher because they [the Germans] bring their effective rate down with various accounting tricks and exemptions. What about the 18 percent value-added tax. Isn’t it too high in Estonia? Our tax system should be predictable and stable. It should be transparent and understandable for taxpayers, as well as tax collectors. In my opinion, VAT exemptions have never met their aim. It is a good political trick to gain votes. The effectiveness of the approximately 120 VAT exemptions applied in old EU member states is questionable. We should avoid exceptions and support those that need to be supported. You said Estonia should adopt the euro before Latvia and Lithuania to keep a competitive advantage in exports, for example. I have not compared this to Latvia or Lithuania. I would be glad if they adopted the euro rapidly. But I want to see that Estonia adopts the euro on Jan. 1, 2007. Why is it an important step for Estonia to adopt the euro? First, Estonia has never used currency policy as an instrument to operate its economic policy. We have a fixed-euro exchange rate at 15.6466, and we are members of the Exchange Rate Mechanism. Financial markets are counting on Estonia adopting the euro in 2007. As a result, Estonia’s rating has been good, and the cost of money has been low so far. If we postpone adoption by one year, and the government has a plan to control inflation, it will not have a negative impact. But if we prolong this for an uncertain time, we will all pay through higher interest rates. A 1 percent interest rate growth, for example, means that Estonian residents have additional dues to the tune of 800 million kroons. Today we spend 300 million kroons on converting kroons to euros. Adopting the euro is a natural step and should be done as soon as possible. What can the government do to adopt the euro by next year? As a politician in opposition, I can do little. But the government has certainly left some things undone. The main Maastricht criterion is that our government does not have problems with public debt. It is almost nonexistent here. We have a surplus state budget. We do not have problems with interest rates. Our only problem is related to inflation, and there is not much our government can do about it – it is largely dependent on world energy prices. Our predictive value for inflation is a little over 3 percent by October this year, when according to Maastricht it should be 2.6 – 2.7 percent. Our state budget increased from 54 to 62 billion kroons last year. Our government could have kept these 8 billion kroons in reserve and not consumed it. It is against my general principles, but we could have established a tax exemption to halt inflation, a 5 percent VAT on food products, for example. Estonia’s GDP is 52 percent of the EU average, and our economy grows 10 percent compared to the EU’s average 2 percent. It is clear that our inflation will in the long run be higher than the EU average, and we should take some administrative measures. Secondly, the government should have reduced its expenses and not generated consumption. Thirdly, it was not appropriate to come out with an increase in environmental taxes, which directly affects inflation. I was glad for Lithuanians when their prime minister decided to reduce VAT on heating as a means to meet the inflation criteria. What are Estonia’s advantages? How can the country improve productivity? The domestic market is very small. I think Estonia’s future is not in labor-intensive production. There is not enough labor. Education is very important here. There are three breakthrough sectors, such as material technology, biotechnology and user-friendly IT solutions, which, if enough resources are concentrated there, will easily attract commercial financing. Otherwise, Estonia will receive 75 billion kroons from the next EU financial perspective, 52 billion of which it can use at its own discretion. We have to establish one or two remarkable science–research centers. The government should also take care of the general infrastructure. Why not cover the whole country with free Internet connection WIMAX. What about Estonia’s geographical location, which gives opportunities for transit business? We should see that Finland communicates with Europe through Estonia, not Sweden. On the other hand, there is St. Petersburg with its huge population. The logistics of these two centers should go through Tallinn. The oil transit we have had so far has become more and more political. The future can not depend on oil transit alone. Should the government intervene to attract Russian oil transit to Estonia? I think there is not much we can do here. Business is business. Our task is to create an attractive environment for those who want to conduct honest business. I think the privatization of Estonian Railway was a mistake. Today we are left with only bad and very bad choices. The best of these is to buy back the railway infrastructure to gain control over it. Today it is a historic opportunity to buy back the shares, and it does not really matter whether it costs 2.2 or 2.5 billion kroons. The government had an exclusive opportunity to buy the shares until last week, and it made a mistake in not taking that opportunity. If this results in moving the shares to private hands, whether seemingly into Luxembourg or Sweden, but actually originating from Russia, then the mistake will be one that we will not be able to correct. Agu Uudelepp, communications manager of the People’s UnionThe council of the People’s Union took an official standpoint that it supports the purchase of Estonian Railway shares for a fair price. It has to be a reasonable price, and it will be decided during negotiations. We were against the privatization in 2000 and collected 163,000 signatures against it. Nobody forces them to sell the shares – it is their own will. Having a private business is taking a risk. It does not work this way that you privatize then your business plan does not work and someone else has to pay for it. In the Center Party’s opinion, the government should buy the shares but should not pay for this too high price. It is up to the specialists and the ministry of economics to decide the price the government is willing to pay. The final price will be set at the negotiations. The privatization of Estonian Railway was bad for the Estonian government. It is bad that the owners of Estonian Railway have not been able to properly fulfill the obligations set in the privatization contract. It has been harmful for the state so far. Otherwise, Estonian Railway would not have been a problem. The current situation is such that the owners of the Estonian Railway have put the company on sale. The government should act according to what the price of the deal is. Three billion is clearly too much to ask. If the offer is lower, why not purchase the shares? The current owners have problems with developing the infrastructure. It is not right to talk about nationalization, which means purchasing the shares against the owner’s will. The privatization was carried out by the privatization agency. They did not weigh all the aspects. The legislation should have been finalized before the privatization was started. I would not have privatized infrastructure, but would have separated operating services and privatized this only. Burkhardt says that there are communists in power. I do not know what he means. All five ministers of various parties have followed the same principles. The railway legislation was adopted a few years ago. He has confused something and tries to cover up his failed business plan. Foreign investors can bravely invest in Estonia. It is clear that legislation has to be followed. Estonian legislation differs largely from that in America, that is probably the key point here. I do not want to comment on whether the railway should be privatized and what the fair price is. There are two kinds of opinions regarding privatization. A majority thought that it should not be privatized. He (Burkhardt) is very emotional and his pronouncements are not true. The current government has nothing to do with it. The legislation was adopted about three years ago; the regulation of tariffs was last year. Besides, there is no Estonian transit without Russian transit. Our position is that railway belongs to the government. That is why we intended to buy the shares. Even if it belonged to Russian capital, the company would still have to follow Estonian legislation. This (privatization) does not have to be the primary step. On the other had, the government and ministry of economics have started to pressure the railway and have made it difficult to manage the railway and have chopped the useful infrastructure. We have to carefully see that it does not get under the Russian capital as a result. We hope that government in the future would benefit from transit and not give it away. We can say that capital has no nationality. The foreign policy of Russia of year 2000 to take neighboring economies under its control makes us anxious. I do not know if the new owner is better than the current one. We do not have a clear standpoint whether or not the government should purchase the shares. We do not know the price. We are in opposition. The government does not certainly have to buy the shares, but may do it if it is beneficial. It all depends on price and the perspectives. Was it reasonable to privatize the railway? In this context it was. The privatization was announced in 1998. The preparation works had already been done when we got in power. In 1999 there was a big minus in the budget, and we could not see any opportunities to place more money in railway. Prior to privatization, the government had to support the railway heavily. Here in 2001 it was already possible to take out proper dividends. The government has purposely made it difficult to manage Estonian Railway and is splitting the effective system. If they had not pressured the company during this last half year, I doubt there would have been a desire to sell the company. (Edgar) Savisaar acts according to influences coming from the East. It does not matter which capital it belongs to. It is important that our government has the control over infrastructure. It can be a Swiss company purchasing the shares that actually may belong to Russian investors. It is certainly not necessary that our neighbor receive such a huge power over our economy. When Edward Burkhardt decided to invest in the Baltics, he went for broke. He sold his railroad business in Wisconsin and bought a 66 percent stake in Estonian Railway in 2001. He assumed the position of chairman, but the job has been anything but calm. Government interference has prevented the company from fulfilling its development plans, Burkhardt says, and has even disillusioned many U.S.-based shareholders. Thanks to two state decisions – not to allow Estonian Railway to raise infrastructure charges for other cargo handlers and to revalue its assets –Estonian Railway has seen a drastic shortfall in revenues. Not surprisingly, Baltic Rail Service, which owns 66 percent of the company (the state owns the remaining shares) has responded by decreasing its financial commitments. Burkhardt, who also owns a rail connecting the U.S.A. and Canada and another in Poland, believes the government is protecting Russia’s transit interests in Estonia. Some fear that Estonian Railway, like other parts of the transit business, will come under the control of Russian transit. Responding to these rumors, Burkhardt says that, as long as the government continues to treat the company this way, investors don’t care who takes over the lucrative transit business. Do you regret your investment? There have been many problems that should not be – all related to the government. But it is also a very fine railway, and an interesting and good experience. I am more interested in running a successful railway than I am in dealing with governments. But we do what we have to do. Did you see a lack of willingness on the part of the state to privatize Eesti Raudtee [Estonian Railway]? I knew that the various political parties saw it differently, but my experience is that if a government makes a deal, the next government will comply with it. This is a norm around the world, but seems not to be in Estonia. They have led opposition to the privatization, but some other parties don’t like it either. I don’t know why, because I thought Estonia was now supposed to be a free enterprise economy not a socialist economy. So I don’t understand this desire to have a government-owned railway. Perhaps we should have government-owned supermarkets and department stores. It didn’t work when it was a Soviet system, so why will it work now? Socialism is a poor economic model. Transit is the main advantage of Estonia due to the country’s good location, and Estonian Railway is in a monopolistic situation here. I never saw this as a kind of monopoly because Estonian ports have to compete with ports in Latvia, Lithuania, Finland and Russia itself. Railways you could look at as a national monopoly, but they all operate within a competitive economy. Railway has to be competitive, or it won’t have any freight to handle. Last year the company had 133 million kroons (8.5 million euros) in losses according to current accounting principles. We only have one kind of accounting that we believe is proper, and it resulted in a loss, and of course it will be a bigger loss this year if the present, very negative situation continues. The normal capital renewal cost for Estonian Railway is 385 million kroons. With this you will have a railway that is no better or worse at the end of the year. But the railway inspectorate is allowing us 129 million kroons for this purpose, for replacement of capital assets. The weighted average capital cost of the railway, based on the value of assets, the return that we should receive should total 606 million kroons, while the railway inspectorate is giving us 180 million kroons. This means that the company, unless there is a change, will not be able to maintain its infrastructure. It will go straight downhill, and it will hardly have enough money to pay the bank debt – and nothing for the shareholders. This is a very negative situation to be in, of course. Our financial figures look bad under these circumstances. We receive no state subsidies. Many railways in Europe do. We should not receive a subsidy because our own market here is robust enough to be able to pay its own way. There is no reason why the transit business in Russia should not pay these costs, which are fair costs that come out of our regulatory framework. These are not some kind of super profits or monopoly profits. They are regulated earnings according to normal regulations. We recognize that the railway is a monopoly here. It is a regulated monopoly. You’ve said that you lose about 800 million kroons in revenues due to low infrastructure fees that the government has set. Is this the reason you don’t want to follow the privatization contract’s commitment to invest 350 million kroons annually? What are we going to use for money? I don’t want to have this property deteriorate, to have speed restrictions and a bad track. We spend a lot of money fixing the track up. When we bought the company it had just come out of government ownership, where it was in poor shape. It had poor locomotives, poor wagons and a poor track. We fixed all of this in the first five years. It was a big issue in the press that the 74 locomotives that you purchased were too heavy for the Estonian track. Where do these ideas come from? You see, we have people here who don’t like us. You know who they are? They are the oil transit interests. We have had a public relations war on us from the day we arrived. Under the days of the government-owned railway they could come in, pay somebody and they could get the price that they wanted. It was full of corruption. You should see the interesting prices that existed at that time. We don’t operate that way. We are honest people. That makes some people very unhappy. So they have had a constant war on us. These locomotives have been a total success here. They are the best thing we did on this railway, because they solved a big problem. The railway had very poor locomotives. We could not keep them running. The Pechory area [Russia] does not want United States locomotives on its track. Is it some sort of market protection? We operated our trains in Pechory with our locomotives, and with no problems. One day the phone rings, and there’s a big problem. This was politics. We know what happened: These Russian transit interests called their friends at the Russian railways and said, “Give these guys a hard time.” So they did. One-third of rail transit goes through Pechory. How did you solve the situation? We had to buy some Russian locomotives just to use across the border. As soon as we get into Estonia, we change these locomotives and put the general locomotives on the track. It is a substantial extra cost. We had to buy these locomotives that are terrible, exactly like the ones we got rid of. They are very expensive to maintain and operate, and of course it is very inconvenient to have to change locomotives. But this is exactly what these Russian interests wanted to achieve here. They raised our costs, but we’re dealing with it. Raivo Vare, former minister of transportation and current development director of Estonian Railway, said that Estonian transit is coming under the control of a big Russian company, Severstal-trans, and the government ignores the takeover process. I think Estonia would be very foolish to trade its sovereignty, which was achieved with a huge personal cost after 50 years of occupation, for financial control of these Russian interests. It is not the way honest and progressive democratic government should behave. This is the problem we face here. Some people fear the shares privately owned in Estonian Railway will get in the hands of Russian transit companies. You have previously said you would not sell it to the Russians. How would you convince them? Hmmm….very interesting question. When I was first here, if I was asked that question, my answer would be, ‘We would never consider selling to Russians.’ Because we understood the long history of Estonia, and we wanted to be ‘good Estonians’ running this railway, and that means a railway owned by Western interests. The objective of the shareholders was to have an initial public offering, where the shares could be sold in Western Europe and America and to Estonians. And that is the way this railway would be owned. It would not be owned by Russian interests. Meanwhile, in the intervening years we have been treated so badly by this government that, in my opinion, I have no more interest in protecting this government. So some of our shareholders would like to sell. They are tired of fighting every day to run this business, so they say, ‘We’d like to sell our stock.’ So far as I am concerned, if Russians come along and say, ‘We wanna buy these shares,’ we will talk to them. Why not? There is no interest in working with us in Estonia, so why not? I am trying to be rational. We try to run a business here. Every time we turn around we have another problem from this government. The government, as a co-owner, has the priority to buy these shares, I understand. I am not so sure. No. It depends on what the transaction might be. I would have to look at the agreements. We have Ganiger here, an Estonian investor. What they do with their shares is their business. If Baltic Rail Service wants to sell their shares, it maybe that the government has the option to pay the same price as somebody else offers. Russian railway is bringing down its prices, which are discriminating across the Estonian border. Yes, because they are going to join the World Trade Organization, which requires that they cannot discriminate against the Baltic states and their railway pricing. This brings an opportunity to start a railway container transit of Chinese products, for example, to Russia. We are quite interested in that market. We are also interested in looking at the north-south market. This is the Rail Baltica. That is Helsinki, Tallinn, Riga, Kaunas and Warsaw. It should be developed aggressively by this railway. But now, can we do any of this if we don’t have money for infrastructure development? We can’t even maintain the infrastructure. Do you have an opportunity to apply for EU funds? There is no reason why we can’t have EU funds, except for the fact that the government has not been willing to apply for them. We have told them time and time again, ‘Please apply for this money. You can get it.’ The money has to go through government – we cannot apply directly. What should be the best compromise for both parties? We want the Estonian government to follow their own law. For example, they don’t want to have [our] assets revalued. But they have revalued the assets of the electric company, the water company and the telephone company here. If they didn’t, you would not have a good electric company, but a deteriorating service. Why should they come in with a different rule for the railway that may do for these other utilities? The assets are not worth the same as they were years ago. I am afraid the government has used every way that they can to hold down these prices for the benefit of these transit interests. So they are starving us. You bought the company for 1 billion kroons and some extra. What is it worth today? I can’t answer that exactly without looking at some data. It is worth several times what we bought because it is a much-improved company, and we have invested heavily in it. The assets of the whole company (including 33 percent state shares) are worth about 4 billion, and this is less of a mark-up than the electric company had. So you consider it a profitable business? It has been a good business up until recently, but has turned into a bad investment. We will work our way through this, and if we don’t, we have courts and arbitration panels that will handle the problem. Estonia just can’t go and violate the law and European regulations. If some country grabs the assets of a private company there are provisions for arbitration. Robert Lepikson is a controversial politician in Estonia. Like Juri Mois, Tonis Palts and other successful businessmen-turned-politicians, he says things the way they are, and has ended up in hot water for it. For instance, when Lepikson’s Porsche Cayenne S, worth almost 100,000 euros, was stolen in front of his house last week, he announced that he’d give a bullet to the thief if Estonian legislation would allow that. Just like in the U.S.A., he told The Baltic Times, where any intruder can be shot in self-defense. Lepikson, an MP, has lobbied for increasing the speed limit and, despite protests by environmentalists, has felled trees in Tallinn for a tunnel project. He has worked in several governments, starting from a chancellor’s post dealing with Russian army assets. Currently he is chairman of the council at Petromaks Stividori, a coal-loading business at the Paljassaare dock that, according to some politicians, keeps him too busy to attend Riigikogu (Estonia’s parliament) sessions. You are the most frequent absentee at Riigikogu sessions. The constitutional committee you belong to told me they haven’t seen you and that they doubt you answer your cell. Is it because you think the state can be governed differently? The constitutional committee is a committee dumped on my shoulders that does not interest me much. Because I am not a lawyer, participating in it does not make any sense. Everybody has to belong to some committee, and that is why I was registered there. Before breaking away from the Center Party, I was in the finance committee. Regarding participation at Riigikogu sessions, I have tried to participate, but there is an interesting day like Monday, when no actual work takes place. The agenda of the week is being appointed and interpellations corresponded. Riigikogu sessions take place on four days, and when I miss Mondays, it already gives me 25 percent non-participation. Should the Riigikogu work be made more efficient? I have a totally different working style. When I need to ask something from a minister I don’t make a political circus out of it, but just pick up a phone and call the minister. So far I haven’t been left without an answer. I find it more operational; it saves the minister’s time and my time. But this year I also had family reasons, and I don’t want to comment on that. If the press doesn’t understand that, they should look in the mirror. Thousands of people have elected you to represent their interests. What are your objectives? Four and a half thousand people cast their vote for me. When I met them during the elections I told them, in a demonstrative way, that I am not going to promise anything. To promise something means to lie in advance, because we never know what the coalition or the government will be like. When I ran for the Center Party, it didn’t even get to power. There were problems in the Center Party, and several people left. Had I promised anything? Had I lied? The only thing I promised to do in Riigikogu was to follow my senses, and that’s what I have been trying to do so far. One thing I promised in the southeast part of Estonia – that I thought I could explain to both coalition and opposition – was the maintenance of roads that are very crucial there, especially at wintertime. And that has been accomplished. What are other painful spots, other than roads? This is a purely philosophical question. Riigikogu members have to see a general picture where the whole country benefits. But I know quite well what the problems in southeastern Estonia are. It is the education on various levels, and the unemployment and lack of employees – all at the same time. The Estonian government has not paid attention to societal dropouts, who hardly manage to cope by themselves. These are people who have not managed to settle in this capitalist world; like tractor drivers, for example, from the collective farm system who find their only consolation in alcohol. There are dreadfully many of them in the countryside. It does not make sense for them to work for a minimum wage if they earn more from support and part-time jobs. Were you able to solve any of these problems as county governor, mayor or interior minister? As a county governor I was quite efficient. The votes I received, which were quite a lot, is a proof of that. Regarding the city of Tallinn, the problems were quite different. The media published all sorts of conflicts about the trees and the tunnel. When I suggested a tunnel near Kaubamaja (supermarket), people said that Lepikson wants to speed and send people underground. Looking back, everybody is satisfied with the tunnel, and it looks like I was just ahead of time with proposals. Society was not mature enough for it. It’s the same story with the trees that I planned to cut on Harju Hill. They brought a gardener from Finland to reject my arguments. Instead, the gardener overrode the greens’ claim that trees have to be cut down from time to time and replaced. Why did you leave the Center Party? I don’t like dictatorship, when it’s the norm in a party. This whole structure and the board and the general assembly is compiled of such delegates that the right “father” gets elected in the right place. It was a true personality cult. When [party member] Heimar Lenk claims that Edgar Savisaar is a godlike person, then it only makes me laugh. This crowd is so hare-brained that I cannot find a common path with them. Then you joined the Estonian People’s Union. The program of the Center Party is not bad. It is the way things are done. I do not like the way power is divided between relatives and acquaintances, as is common in the Center Party. I find that city leaders should be elected based on other criteria. I don’t like, for example, that city district leaders are politicians. It does not really matter who sets the tubes and repairs the roads. It is not a healthy approach. There is a fight in Tallinn city for the post of a small prime minister, the mayor of Tallinn, who manages the 5 billion kroon budget. One of your major gripes was that the Center Party was against joining the European Union. This wavering until the last moment, and the lies, were unacceptable for me. I have always tried to tell the truth – however unpleasant it may be. Before the party supported EU membership, I would never have joined the party if it were against the EU. You sued two newspapers that claimed that Riigikogu paid the lease on your wife’s car. You said that you leased it before you received a seat in Riigikogu, and you were the one to use it while in Riigikogu. We should not have freedom of press without responsibility for what is written. It is easy to pour sewage water over someone in a paper with a circulation of 60,000, but they only use a small corner of the newspaper to clean it up. That’s not fair play. I’ve won all instances so far. The most amazing thing is that the newspaper is not going to apologize. The Estonian legislation does not foresee that. The other thing you fight for is a professional army. As an engineer and member of the delegation of Estonian Parliament in the European Union, I have had a chance to see modern weaponry, and it is not difficult for me to understand that people who have to spend eight months in the army against their will shall never learn to use the weaponry. For this reason it does not make any sense. We should have a professional armed forces that knows how to use its weapons to their maximum potential. Most of the weapons used have been given to Estonia as a gift, and are 40 years old. They make nothing but cannon fodder out of our soldiers. If someone attacks us with modern equipment, they defeat us kilometers away. Would 2 percent of GDP be enough to cover these expenses? It is not enough. The only way to ensure security is to have a clever foreign policy and be part of international unions such as the EU and NATO. We have to be ready to help NATO create a situation with the right foreign relations, where no one will have a desire to attack us. Besides, I don’t like the dumb picture of Russian horror, that no one dares to speak out. As a businessman, I find that it costs more [for Russians] to start a war than to just buy everything. We ourselves have created a wonderful opportunity for this while privatizing infrastructure objects such as Estonian Railway, which can be purchased by any company from any country. This can be done by a hostile adjoining state for example. It seems not much has been done to improve Estonian-Russian relations. That is very sad in my opinion. We can choose our wives, but we can’t choose our neighbors. We have to get along with neighbors. Blaming each other does not take us anywhere. I find that our policy toward the East is weak, and relations are not the best. I would like to bring Finland as an example, which, thanks to good relations with Russia, at one time developed quite rapidly. As the situation changed due to economic reasons it affected Finland badly. I have served the country seriously for more than 10 years. If I had had my private business, it would certainly have been more beneficial for me. At the beginning of the 90’s, I built up the Estonian Metal-Export, which was later sold to Finnish investors for a couple hundred million kroons. I started this from sitting on top of a sewage bin. Then I went into politics and was a chancellor, which is the second highest post of the civil servant, after that of state secretary. I was in the defense ministry and dealt with the assets of the Russian army. Then I was a counselor for the prime minister, Tallinn mayor, minister of internal affairs, Voru county governor. Now I’m a member of Riigikogu. I have practically gone through all Estonian government administrative stages except two – prime minister and president. There is nowhere else to go. I can assure you that I know how this country works on all levels. I am often very sorry that these experiences are not being used, and people want to proceed from the party interests or the interests of party members when making decisions. The interests of the state come third, or at best when the two first needs are satisfied and being taken care of so state interests are not damaged. I want to see that the political culture improves, and that people are not being told lies at elections, where some parties give promises that are not under their competence. What do you do on the EU affairs committee in Riigikogu (Estonia’s parliament)? Perhaps the most outstanding issue in the committee is the question about Estonia’s fulfillment of the acquis communautaire. Today [Nov. 14] we shall have a committee meeting where we discuss how many procedures the EU has started against Estonia. But in general the role of the committee is to supervise the government’s positions in the European councils, and we also closely follow the question of how EU money is being used by Estonian authorities and others. You were minister of foreign affairs between 2002 and 2005. What were the main issues that you handed over to the new minister and what were the ones that you had to deal with yourself? I left with a good feeling because the two big tasks were fulfilled – Estonia became a member of the EU and NATO. There were a number of challenges the new minister had to face within the ministry. Since income to the Estonian state budget increased enormously this year, a number of questions can be solved such as structural development within the ministry and the broadening of Estonian foreign policy capacities in other member countries and outside the EU. We are planning to open representations in the Middle East and southern European countries. What was your stance toward Russia? You were quite cooperative compared to some party representatives, who suggest that Russia should be ignored. Interesting that you say that. The Russian-speaking media accused me all the time of not being cooperative enough, and the Estonian media always accused me of being too ready to cooperate with Russia. Looking back on those three years, I should say that my experience was mostly negative. Russia and my Russian colleagues did not respond to this openness that I truly had at the beginning of my time in office. For example, I was never invited to Russia as a foreign minister; at the same time we are neighboring countries and have many issues of common interest to discuss and probably resolve. I am not only speaking about the big border treaty issue, but also of bilateral cooperation, economic cooperation and cultural cooperation. The regions near the border need this cooperation, and cooperation is needed on the highest political level, which was lacking then and also today. Is it possible that it was a personal approach, because you are a woman? There are traditions in Russia about a woman’s position in society. (laughs) No, I don’t think so. There have been strong political women leaders in Russian history – take Catherine the Great, for example. Or Valentina Matvienko in current politics. She is a very outstanding politician in Russia and very powerful. What could have been the reason you were sacked from the minister’s post? Was it the confidential documents that went missing or something else? It was a political decision of [then Prime Minister] Juhan Parts. Juhan Parts made the decision together with his few friends, warning our party leader just a few minutes before firing me. The way he did it was absolutely unacceptable to the Reform Party. He did it before the investigation of missing documents was finished and before the final report was handed to him. And what has changed now? If you ask the ministry if someone was punished for the missing documents and what happened, then you see that nothing much has happened. There were documents missing throughout several years due to poor records, but it was also a good reason to use the situation against me. Foreign Minister Urmas Paet was scheduled to attend a roundtable on Russian-Estonian border relations in St. Petersburg on Nov.10 but was denied entry by the Russian Foreign Ministry. How would you comment on this? Could it be because the visa application was turned in late, or was it a political decision? I don’t think it was about the round table, nor who was invited. It was a foreign minister of a EU country, NATO country and neighboring country, who did not receive a visa. In any case, whatever the reason, if foreign ministers want to visit a country, they should get the visa. It is a question of good relations and diplomacy. We have had a number of cases in the past where the application was submitted quite late, but with a diplomatic passport they normally receive the visa. The question is one of attitude. Estonia has been a member of the European Union for one-and-a-half years. Has everything turned out the way you planned? If we put positive and negative experiences side-by-side on the balance sheet, I think there are more positive things. In opinion polls support for the EU is higher than it was before joining, when it was hardly 50 percent. Of course we have had negative experiences too. Sugar regulation is an extremely negative example. The current EU sugar regulation is a nonsense of the 21st century and should be changed as soon as possible. You are an expert in EU matters. What is the EU’s future in your opinion? As it looks at the moment, frankly speaking, I don’t see a light at the end of the tunnel because of too many things that we’ve seen in the last one or two years. It does not have to do with EU enlargement, but rather with an understanding among old EU countries that things can’t last forever the way it has for the last 20 years. The EU has been very successful, but now with globalization taking place, it influences us so much. We cannot close our eyes to the fact that China is developing faster and faster, and India is right behind. If EU leaders do not want to carry out rapid changes and are afraid to make necessary reforms in their countries, they will put us in a situation where we’re not able to compete on a global scale. I’d like to add that the political future of the EU is fragile at the moment. I agree with Margaret Thatcher who said that the EU should first of all be a basis for economic cooperation.